Japanese news blog Ryokutya has reported from Jump magazine that there is a new information batch on Bandai Namco’s Gintama Ranbu which introduces more characters in what has been proclaimed to be Gintama‘s last game. Kamui – He will fight with high-speed and close-ranged martial arts. Tsukuyo – She can sweep enemies from long range with her kunais. Other than those two, Kagura is also reported to be able to activate her Yato Awakening mode in this game, which will raise her speed and attack power at the sacrifice of her defense stat. And two more characters are confirmed to only appear as boss NPCs (like the first revealed Okada Nizo), which are Housen and Abuto. 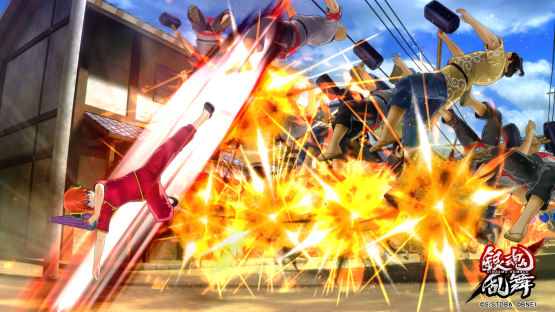 Bandai Namco’s Gintama Rumble will be released in Japan on January 18, 2018, for PlayStation 4 and PlayStation Vita. An English localization has also been announced for Southeast Asia only on the PS4, but the release date for the Asian English version has not been confirmed as of yet. For those who are still wondering what kind of gameplay Gintama Rumble has, you can watch the first official PV that was recently published by Bandai Namco below. It is shaping up to look like a Dynasty Warriors-esque Gintama game.